From time to time, I receive emails asking me if people in Mexico ever eat salads, and the answer is yes, we do eat salads. Besides the famous “Cesar Salad”, there are other salads that we prepare, but they’re usually very simple in ingredients, the reason being that we already add a lot of vegetables to our main dishes. We have Chayote salad, Nopales salad, squash salad, watercress salad, and the popular Christmas salad, just to name a few. When I was growing up, a salad consisted of a mix of lettuce or shredded cabbage with tomato, onion, cucumber, radishes and a drizzle of olive oil and lime juice to top it off. There were no bread croutons or any other add-on. And besides the rice and main dish, we would also eat seasonal steamed vegetables as a side dish. Chayotes are also added to many stews (like the well-liked Caldo de Res and Caldo de Pollo), cooked on their own in a tomato sauce, and also battered fried and served on top of a rich tomato sauce. While the chayotes are cooking, mix the olive oil, vinegar, salt, and pepper in a small bowl. Before adding the oregano to the dressing, crush the oregano with the tips of your fingers. Add the oregano to the dressing along with the onion and mix. Taste and add more salt if needed, based on your personal taste. Once the chayotes are cooked, gently remove from the saucepan using cooking tongs and drain. Now, with the help of a vegetable peeler, remove the peel. Cut the chayote into cubes or slices. Place the chayotes on a serving plate and drizzle with the dressing. You can serve this salad either cold or warm. As I mentioned above, you can also add some Queso Fresco cubes to the salad. Enjoy! 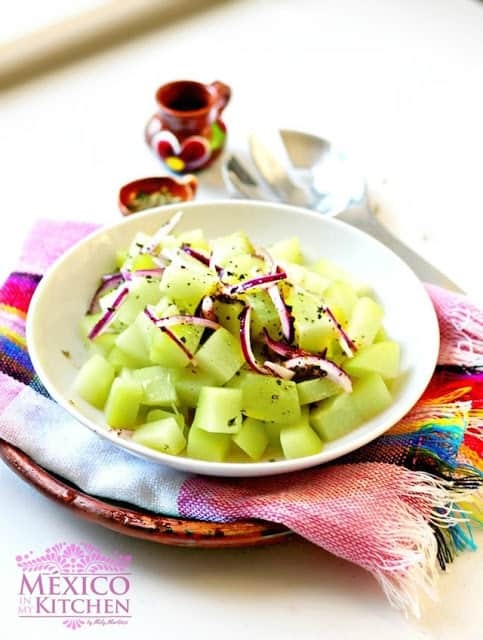 Chayote Salad Recipe | Chayotes are also added to many stews (like the well-liked Caldo de Res and Caldo de Pollo), cooked on their own in a tomato sauce, and also battered fried and served on top of a rich tomato sauce. Place chayotes in a saucepan and cover with water. Cook over medium-high heat until they are soft and a knife can be inserted easily. This process will take about 15 to 20 minutes depending on the size of the chayotes and how tender they are. Usually, larger chayotes take longer to cook. Leave a comment and share your experience with the recipe. Have you tried Chayotes? If you are on Pinterest, check our boards with hundreds of delicious ideas I’m pinning for you! I'm making this tomorrow! 😀 I love chayotes! Have you tried puré de chayotes? It's delicious. I'd like to see more Chayote dishes. I was introduced to this vegetable in Guadalajara, when I spend the summer of 1996 there. I love chayote, but don't know many ways to prepare it. My summer hostess made it with a cream sauce. I love all things Mexico and all things salad. I usually put chayote in soup, but I've been experimenting with slaws, using the raw chayote cut into matchsticks. I never thought to cook it first, this is a great idea for warm salads. Right now I have chayote (raw) and just barely ripe mango, thin red onion, cilantro, lime juice, serrano chile and salt as needed. 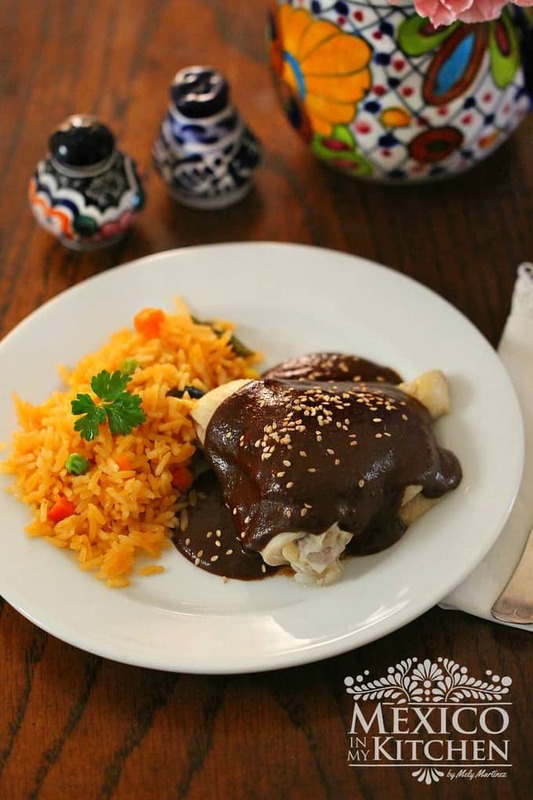 Good with mariscos, on its own as botanas / antojitos… where's the chelada?!! I wish they had cantinas here like they do in Mexico!